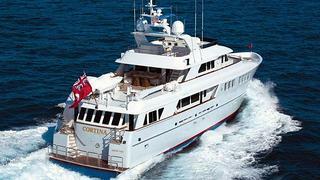 A call to Camper & Nicholsons brings news that Bob O'Brien has signed the 34.75m tri-deck motor yacht Cortina for sale. Built in aluminium by Newcastle Shipyards in 2010, she offers accommodation for eight guests in a master suite, VIP stateroom and two twin cabins while twin 2000hp MTU engines give her a cruising speed of 13 knots. Cortina is asking $13.75 million.